This is actually two hikes off the same trail system but easily done in combination as both are around 4 miles and in combination it is about 7-8, depending on how far into Watson Lakes you go. Watson Lakes is at the edge of the Noisy-Diobsud Wilderness Area and a great fall color spot and is made up of two main lakes, a few ponds and streams along with a waterfall or three. We thought we were a little late for the color but lucked out and found the blueberries and heather still going strong. 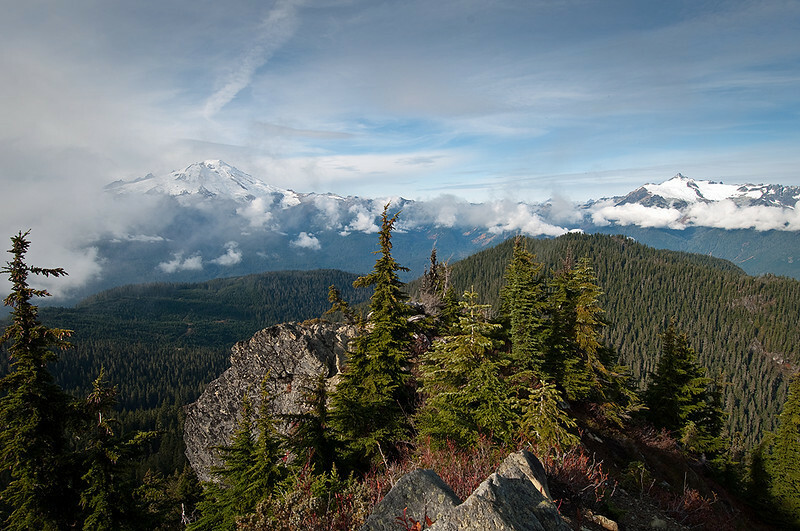 Anderson Butte offers wonderful views of the east slopes of Mt. Baker and dozens of other peaks all around. We actually could see Mt. Rainier over 100 miles to the south the day we hiked up along with many more. On the way back out we hiked up to Anderson Butte. This is the view west looking at Mt. Baker on the left and Shuskan on the right. Anderson is an old lookout site, closed in the 60's.